Apart from large jars and bottles, condiments today are available in single-serving packs that are convenient and highly useful especially in our fast-paced world. These on-the-go packets are worth buying because they are convenient, take less space, almost have no weight and make no mess. You can easily pack these with your lunch or keep in a container in the car or desk. Made with real tomatoes and a sweet tangy flavour, Hunts Tomato Ketchup comes in small single-serving packets that are super convenient to take wherever you go. With easy, tear-off packets, feel free to squeeze Hunts on your fries, sandwiches and instant noodles to make them saucy and juicy. A delicious blend of mustard seeds, Vinegar and natural spices, French Classic comes in perfect consistency and right quantity for one-time use. For all those who like Sriracha hot sauce in everything and anything, this is the ultimate go-to choice. With the perfect amount of sauce in each sachet, Grab N Go doesn’t waste or drip when you open the pack but comes out smooth even when you are in a bus or train. 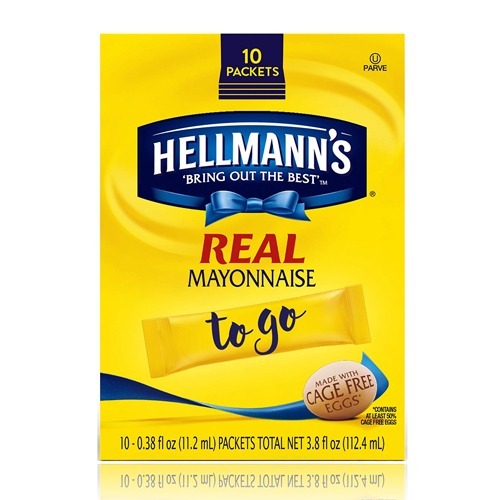 Hellman’s Real mayonnaise is taste and convenience in an affordable price. Made with natural ingredients, cage-free eggs, vinegar and oil, Hellmann’s is rich in omega 3 and transforms your meal giving you rich, creamy goodness in every bite. Jif To Go creamy peanut butter is a pack of mouthwatering single-serve cups with rich and smooth peanut butter that makes an ordinary bread enjoyable and wholesome. Made with real roasted peanuts and sugar, it contains less of sodium and requires no refrigeration. A perfect deal to be used during long trips and picnics. Honey is one of the most useful condiments and its regular consumption in food and beverages adds a lot of benefits to our health. Since carrying a honey jar isn’t practical, Kraft Honey comes in easy and convenient pouch packs. These pouches are hassle free and the quantity in each pouch is perfectly sufficient for one time use. For that creamy, tangy flavor to your salads, subs and fries on the go, get these miracle whip single serve mayonnaise by Kraft. Each packet is less of calories and fat as compared to any other mayo but tastes equally tempting to be forgotten at home. For this Sriracha Aioli sauce, the name speaks for itself. K!ck is a tantalizing sauce with no artificial colors or high fructose corn syrup that gives your boring and bland sandwich an instant kick. With the right quantity and blend of spices, K!ck comes in convenient packages that are easy to carry anywhere and also provide portion control so that you don’t take too much. Hidden Valley Ranch comes in portable, disposable cups that are light in weight and easy to open. Superb for lunchboxes or on the go meals, it is made with rich creamy buttermilk, garlic, salt, onion and fresh herbs to make your salads tantalizing and tasteful. Each pack contains 8 single-serve cups; sufficient enough to last a week or more. This on the go Heinz Thousand Island Dressing single serve pack is loaded with taste, flavor and wholesome goodness. Whether it’s a salad, burger or fries, these portable packs are ready to give your meals a boost of sweet, tangy and spicy onions, relish and tomatoes in a thick creamy texture. You see Tabasco on the table and you know you can’t resist. So here comes the same taste and quality in individually sealed packets. Now give your food a little kick with these on-the-go packets anytime, anywhere. Whenever you are running late from work or have no time to eat a proper meal, nothing is healthier than hummus; a blend ofChick peas, Sesame paste, sea salt and natural spices. So give your pita bread and veggies a fulfilling dip of Wild Garden Traditional Hummus. The creamy and salty traditional hummus in a ready to eat, easy to squeeze tetra packet. This American Mustard is a tasteful punch to every meal. Made with premium mustard seeds and high quality spices each single serve packet is rich, creamy and the perfect quantity you would want to toss on your hotdog, salads and sandwiches. For an additional flavor, Gulden’s also offer yellow mustard and zesty honey mustard in the same packaging. If horseradish isn’t a regular condiment you use, buying a jar that goes half wasted is not a wise option. Hence, Heinz a trusted name in condiments brings Horseradish sauce in convenient, easy to use single-serve packets that can be used on the go, during picnics, social events and simply be stored at home without the refrigerator. A quick and portable solution to make your salads and snacks tempting and worth eating is the Kraft Balsamic Vinaigrette Dressing. The perfect blend of flavors in the right consistency and richness, Kraft is instant, healthy flavor in a packet that requires no cleaning and no mess. Simply carry it around in your bag pack or store some in your car. A condiment can help anything taste better includingsandwiches, pasta, salads, fish, bread and of course fries, these easy pack must-have condiments are great items that spice up your food. All the above condiments are available in mini-packets, single serve plastic jars and containers.